KC Water Heaters: Water heater is leaking from tank, can it be fixed? Water heater is leaking from tank, can it be fixed? It's really common for people to call and ask if we can fix a leak in there water heater. On most occasions a leaky water heater means you will have to replace the entire tank. There are however a few exceptions where a water heater can be leaking and not necessarily need to replaced. A water heater that is leaking out of the temperature and pressure relief valve does not necessarily need to be replaced. 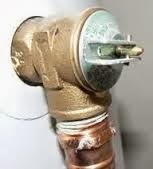 This valve is a safety device that is required on every water heater sold in the US. This valve is designed to open up when the temperature of the water exceeds 210 degrees or the pressure exceeds 150 psi. These valves only cost about $10 and once they are opened up they will usually start to leak. It's also important to understand that these valves don't always work properly. The inside of the t&p valve can get blocked with sediment which will prevent the valve from opening. If the T&P valve has started to leak from your water heater it's usually an indication that thermal expansion has taken place. You can usually replace the valve to get the water to stop leaking but it will most likely start to leak again after a few days or weeks. A leaking T&P valve is a good indication that you need to install a thermal expansion tank. After installing a new expansion tank you should also replace the T&P valve. If you have water leaking out the bottom of the tank drain valve it's also an indication that thermal expansion has occurred. You have a few different options when this type of leak occurs. The first option would be to replace the drain valve. This will require turning off the gas or electricity and completely draining the water out of the tank. 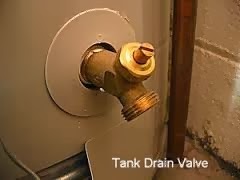 Once the water heater is empty you can unscrew the drain valve with a cresent wrench or pair of channel locks. If you are really on a budget and just want to get by you can always purchase a cap from the hardware store which will usually stop the water from coming. It's important to understand that this is not a permanent solution. If thermal expansion has caused the leak there is a good indication that your tank or tp valve could start to leak in the near future. When you have a leak that is difficult to find the source or if water seems to be pooling around the top of the water inlet and discharge it's a good indication that the inner tank has failed and your water heater is beyond repair. Check above the water heater to be sure that it's not one of the overhead pipes leaking down. When a gas water heater starts to leak it will usually work for a few days until the pilot light goes out. In some cases it can leak for weeks and still continue to operate and perform adequately. The downside of not replacing your water heater immediately upon noticing a leak is that the leak can get worse. Removing an old leaking water heater can cause damage to flooring as well as other parts of your home. We usually recommend turning the gas and water off as soon as you find a leak and draining the tank to prevent further damage.